Draven Rodriguez made national headlines this month when he released a photo he wanted as his senior portrait for his high school’s yearbook. 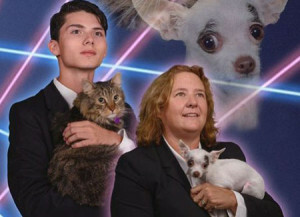 The image is of Rodriguez holding his cat, Mr. Bigglesworth, accompanied by blue and pink lasers. And it’s pretty unique. He started a petition drive with the goal of getting 500 signatures. He has received 7,408 signatures on ipetitions.com. 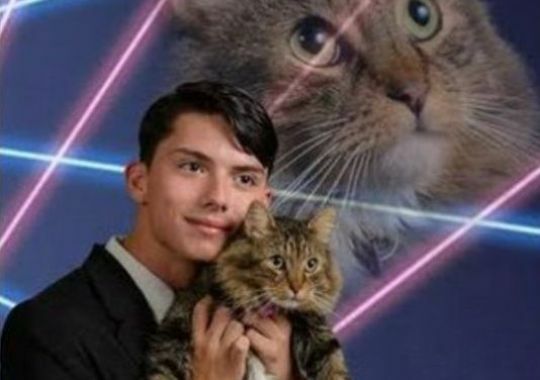 School district spokeswoman Karen Corona told USA TODAY Network via e-mail in early September that it “would not be acceptable for the senior portrait section.” And students do not have to have an image in that section. But it could go elsewhere in the yearbook. The high school in Schenectady, N.Y., reached a compromise last week. His principal, Diane Wilkinson, would also appear in the photo with their animals, and the photo will appear on the principal’s page in the yearbook, the Daily Gazette said. “The school and I have worked out a compromise we’re all happy with. It’ll be in there, just not in the senior section,” Rodriguez wrote on his petition page website. Both animals are rescue pets. The principal’s dog’s name is Vivian, the photographer, Vincent Giordano, said, and the goal is to raise awareness of rescue animals through the American Society for the Prevention of Cruelty to Animals.